Having an epic (large task that is divided into multiple sprints) gets complicated when you need to assign multiple subtasks to a project. Like you're not going to go each task and assign it, that's like 4 clicks and some typing. 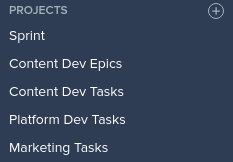 So what you can do is select the subtasks by click-drag or click+shift+click and drag them into the main task, then multi-select those and assign them to the project you want. Then drag them back. Only the last step has to be manual, but still pretty fast..